Here’s another dish using the basic yellow sauce. See – it might be a bit of a faff making it, but there are a myriad of uses for it! This recipe is for delicious chicken satay on bamboo sticks. 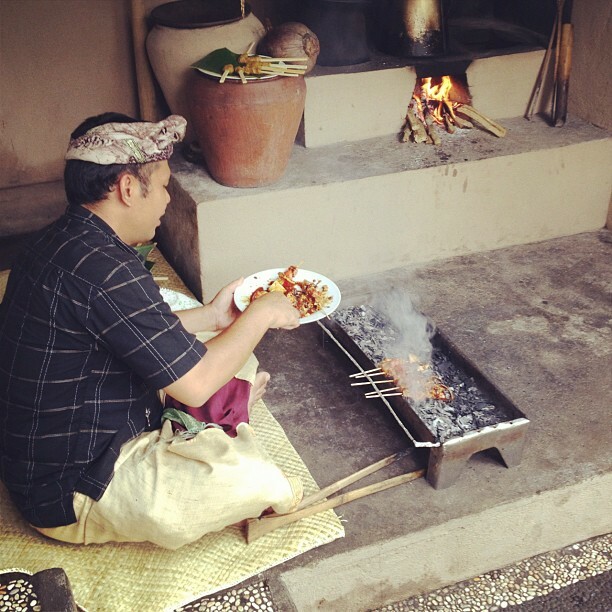 At the class we cooked them the traditional Indonesian way – over a charcoal brazier, but they would be just as good on the barbeque! Cooking chicken satay over the charcoal fire. 1. Add the minced chicken, base gede, coconut, palm sugar, fried shallots, salt and pepper into a bowl and squeeze the lime over the mixture before mixing thoroughly. 2. Take one tablespoon of the mixture and form a bal. Mould the ball onto the end of a bamboo stick. Repeat the process to make fifteen sticks. 3. Grill the sticks over charcoal or a hot-plate until the meat browns then serve as an appetizer or as a main course with steamed rice. A photo of the finished sticks can be viewed at the basic yellow sauce recipe.